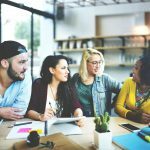 Do you want to increase the size of your social media community? Do you want to have more leads to send your emails to? 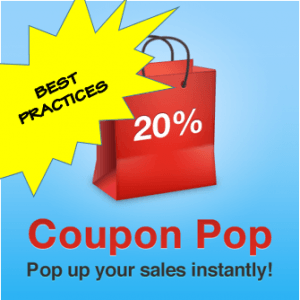 If growth and increased sales are remotely important to you, then you should be using Coupon Pop. We developed “Coupon Pop” so that eCommerce businesses – small, medium, and big – could automate their marketing efforts so lead generation transforms into the simplest task of running your business. The following is a brief and inclusive look at exactly how Coupon Pop works. At the same time you’ll see some awesome examples of on-site promotions that’ll inspire you to create something exquisite today! Why do You Need Coupon Pop? We’ll let the long proven statistics explain the answer to this question to you. On average, only 2% of traffic converts on the first visit (source). For every $92 spent on driving traffic, only $1 is spent on optimizing the shopping experience for conversions (source). If you need more reasons to add Coupon Pop, you might just be looking for reasons why not to use it. What Can You Do With Coupon Pop? This is where things start to get interesting. Obviously, on its own the Coupon Pop is already a fantastic tool, but, in keeping with StoreYa’s love of customization, we gave you the ability to make it look and feel exactly how you want it! The design of your Coupon Pop can be completed within just a few minutes, depending on how you want the coupon to look. Every aspect of your Coupon Pop’s appearance is customizable, from the color, images, and the side tab. Here’s a rundown of the different customization options. Branding plays a big part in sending a message to your customers. Each brand has its own colors, and we know that. One of the reasons that many website owners don’t want to use popups is because they don’t look as if they are a part of the website. That is a problem we are able to tackle. Tiger Mist creates a beautiful popup that uses pink in their popup just like they have on their site. 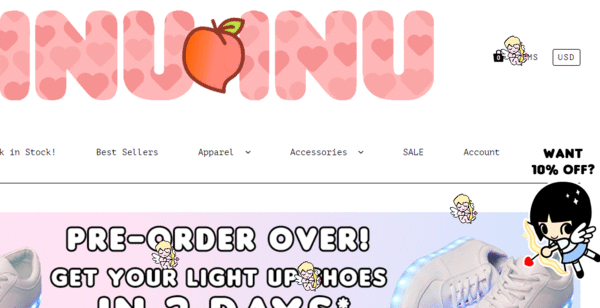 Notice the pink logo on the top left corner, as well in the pink in the header image and call to action, ‘Shop Sale’. This is an ideal job of matching the color scheme of the coupon pop with the rest of their website. Enter the Coupon Pop setup, scroll down to “Tab Design”, and there select “tab color.” You will be able to select whatever color you want (see how it looks in the live update on the right hand side). To edit the color of the text (all of it: headline, call to action, explanation), see the ‘Text Color’ button (very similar to ‘Tab color’) in the “Popup Design” section. 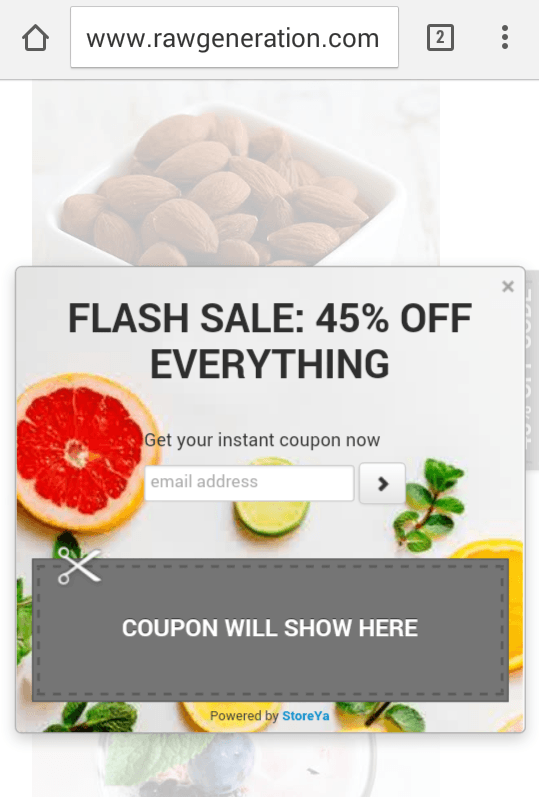 When it comes to adding images to your Coupon Pop, you can either add an image to act as a type background image or vice versa as a side image that is displayed to the left of the text/promotion. We have short attention spans. We want short content. We are simply a tough crowd to engage. So, adding an image is recommended – although not a must. 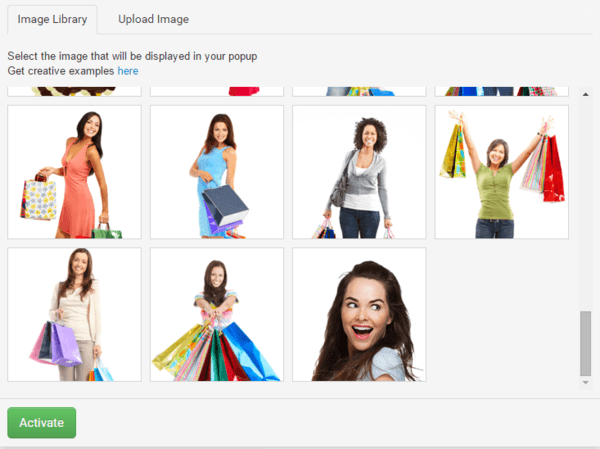 Here are three options: an image as a background, an image to the side of the promotion (your own image or from our gallery), and a popup without an image. Here’s one of our personal favorites, and I’m sure you can understand why – from a design standpoint – this is such an effective promotion. You can add in an image from the tab entitled “Popup Design”. From here you can choose to upload your own image or to use one of the many images that we provide for free. You can add in an image from the tab titled “Popup Design”. From here you can choose to upload your own image or to use one of the many images that we provide you with. Many of the images are holiday themed so you can boost your sales in time for the holiday season! You can either select an image from our image gallery or upload your own. 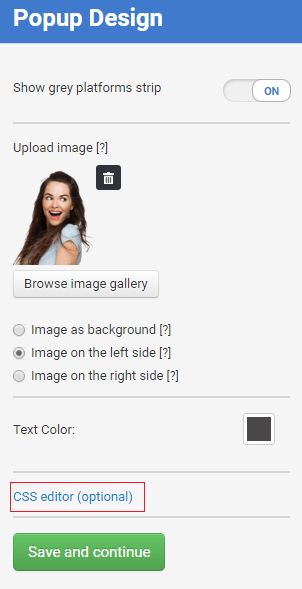 In addition, you can (with the click of your mouse) decide if the image will appear as a background, to the left of the text, or alternatively to the right. Pro Tip: Be sure to change the images during the holiday season. Many of the images are holiday themed so you can boost your sales in time for the holiday season! Just as you can customize the images being used in the popup itself, you can also customize the side tab that that’s displayed on your site. The first option is to go with the regular, standard option that we offer. However, we have a ‘tab gallery’ full of other attractive options, perfect for the regular days of the years and a few more for the holiday season! Aside from that option, there is also the option to add your own image as a tab for the Coupon Pop. Here’s one of the best examples from Inuinu; there’s no way that tab goes unnoticed. In the past they’ve even used a gif! Adding a custom tab is simple and takes just a few minutes. Scroll down on the left hand side to the section called “Tab Design.” Then select “browse”. Once you’ve clicked this, there will be the option to either use one of the default tabs, or to upload your own image. If you want to get very creative, you can take the design process one step forward: using the CSS editor if you have CSS skills. With the CSS editor you can fully customize your Coupon Pop, just like this example from Birthday Girl World. Why CSS? This is definitely not a must, but if you do want to surprise your visitors with an attractive, and branded on-site promotion that fits in with the rest of your website, using CSS is a smart choice. The above Coupon Pop is one of the top performing Coupon Pops (earning an ROI they probably never expected)! Scroll all the way down to the bottom of the sidebar. Click on the CSS editor button and you will see a pop up screen like this one below where you will be able to make your changes to the Coupon Pop. If you are going to use CSS, then take a look at our pre-made guide. In case you were wondering, Coupon Pop is mobile friendly! Here’s an example from one of the very successful businesses using Coupon Pop. In addition to the design of the Coupon Pop, you need to decide what the message you are going to convey to shoppers with your words. Each of the following strategies for the copy you place on the popup can lead to immediate growth and a high ROI. There are numerous things that once can do with Coupon Pop. The simplest thing you can do with Coupon Pop is just set it up one time on your website. Not only is that the simplest thing to do, but it is also one of the most effective. 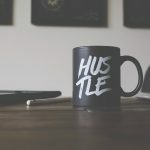 Here’s how one web store (out of tens of thousands) is using the Coupon Pop with a short title, and sale to grow their business. Another great strategy for getting an extremely high ROI on your automated marketing is by creating a sense of urgency. The simplest, and one of the best ways to create a sense of urgency is by giving a deadline (short is good, more than a month is almost meaningless). As stated earlier, one of the reasons that Coupon Pop is able to bring such above-average results on a constant basis is its basis to offer a win-win relationship. You win by getting more leads ASAP, whether or not they make purchases, and the customer wins by getting a discount. You actually win again when these customers make repeating purchases. 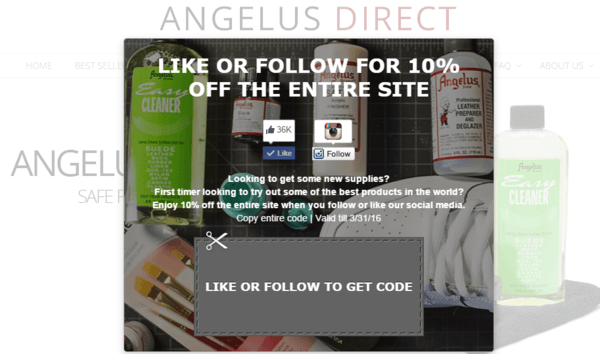 Still, you should make it clear to your visitors what they will get for following your social page or opting in to your newsletter (other than the discount). What are the long term benefits of liking your page? 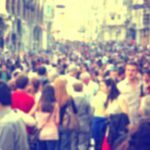 Do you run a site in Spanish? French? German? The Coupon Pop supports all foreign languages. You can utilize the Coupon Pop tool to build your community no matter what language you run your site. Why create a rectangle pop up when you can create a round one? This Coupon Pop from Brayola makes us think the team had fun creating it, and they want you to have fun shopping. Of course, that message is a reflection of their brand (making shopping for the right bra headache free), but shouldn’t that reflect your brand too? Why does this Coupon Pop get an A+? The pop up is beautiful, and catches the visitor’s eye. 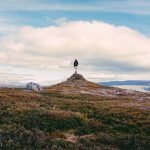 The title is simple, and the call to action above the email field also goes a step above, telling you what you are getting, instead of just telling you to sign up. Finally, they include a deadline to increase the urgency, and use a calming variation of the color green to reel in the leads. Customization. By now you know that customization is something that we think is super important. Hence, we recently created a new feature that enables anyone using Coupon Pop to launch multiple popups on the site! What’s that mean? The multiple campaigns feature enables you to have more than one Coupon pop active on a site. For example you could have different popups on the homepage and product pages, or you could have two different variations on the same page (and target each one to a different audience). With that in mind, what can you do with ‘multiple campaigns’? You can create a different popup for each one of those sources. 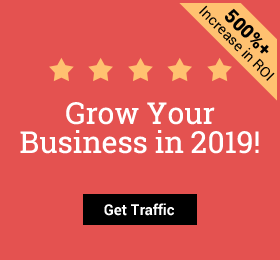 Let’s say you want to grow the number of Facebook followers you have as well as grow your email marketing list. If a traffic source comes from social media, you could activate a Coupon Pop that features the email signup option, whereas any traffic that comes from search engines or paid campaigns could activate a Coupon Pop that requires the person to like your page before they can get the discount. Alternatively, you can choose to create Coupon Pops that are activated for each source on a different page. For instance, for direct traffic, you could activate the Coupon Pop to appear only on product pages, whereas for paid campaigns you’d have it on the homepage (to ensure successful lead generation, at the very least). Finally, if you want to test any of the elements discussed in this post – design or text in the promotion – then you can use the different targeting rules in order to test which popup is the most effective. You may not get a conclusive answer of what does work, but you will get a better idea as to what trends can bring you the best ROI. Having a tool that is easy to customize and possible to launch within just a few minutes is something we pride ourselves upon. However, we know that in order to help you reach your potential and hit optimal growth, there needed to be an analytics dashboard that would enable you to understand how your popups are doing. 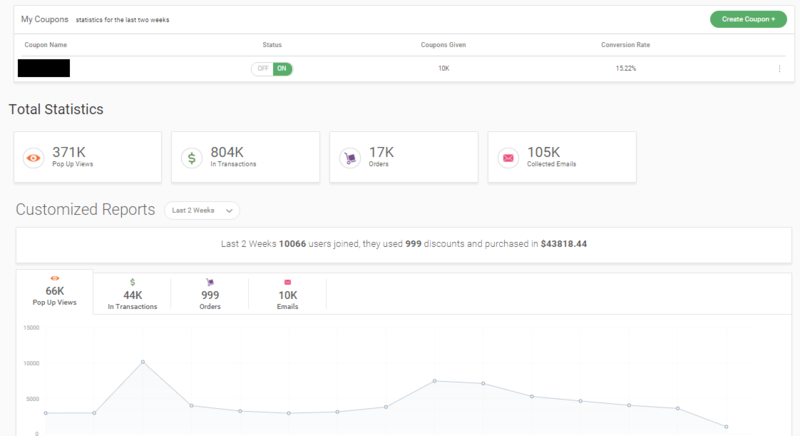 The new Coupon Pop overview shows you not only the conversion rate of any Coupon Pop that you ever ran, but also the actual results: followers, transaction, orders and more. The customized report seen in the above screenshot is for a two-week period, but you can easily change it to show you any other time period of your choice. If you are using more multiple Coupon Pops, you’ll see multiple lines that document each Coupon Pop that was active for that time period. The combination of the multiple campaigns feature and the Coupon Pop overview will enable you to always know what promotions are working and which ones are not! You know that you need an on-site popup. I’ll remind you: (1) on average, only 2% of traffic converts on the first visit, and (2) for every $92 spent on driving traffic, only $1 is spent on optimizing the shopping experience for conversions. You also know that Coupon Pop is your best option. Not only can you launch it within two-three minutes, while customizing it to fit your brand, add images without any coding, target a popup based on the traffic source, and always know how well your Coupon Pop is converting at any given time. I don’t know about you, but it sounds like the Coupon Pop gives you everything you need to grow your business. 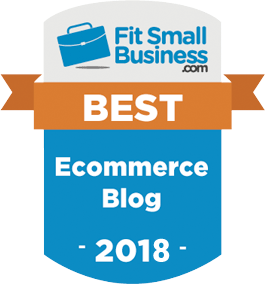 This entry was posted in Announcements, Best Practice, eCommerce Tools. Bookmark the permalink.